I’m sitting in training this week with our Solution Architects team and was talking to my long time colleague Scott Fehrman about a customer I recently met and a mention of the Open Provisioning ToolKit (OpenPTK) in one of the slides. OpenPTK is an open source project that Scott, Terry Sigle and Derrick Harcey founded at Sun Microsystems some years ago. As we’re talking Scott realized that the website that hosted OpenPTK source code, issues and downloads (java.net) is gone. As he had a copy of the latest version, he put it back online on his github account. 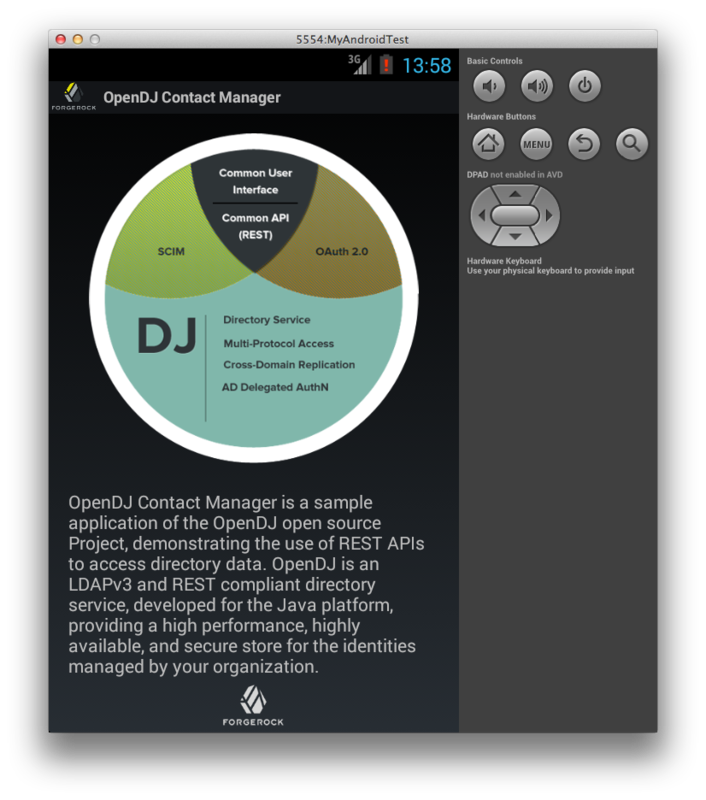 OpenDJ, the open source LDAP Directory Server, was the first to propose a native HTTP REST / JSON access to the data. In the next major release, OpenDJ will be providing many enhancements to the REST interface, that I will describe in a series of posts. To start with, let’s talk about the new administrative interfaces added to manage the OpenDJ server. When the HTTP access is enabled, OpenDJ creates by default 2 administrative endpoints: /admin/config and /admin/monitor. /admin/config provides a read-write access to the configuration, with the same view and hierarchy of objects as the LDAP access. All of the operations that are possible with the dsconfig command, can be done over LDAP, and now REST. As a matter of fact, the /admin/config API is automatically generated from the same XML description files that are used to generate the LDAP view and the dsconfig command line utilities. This means that any extension, plugin added to the server will also be exposed via REST without additional code. /admin/monitor provides a read-only view on all of the OpenDJ monitoring information that was already accessible via LDAP under the "cn=Monitor" naming context, and JMX. The /admin REST endpoints can be protected with different authorization mechanisms, from HTTP basic to OAuth2. And the whole endpoint can be disabled as well if needed using dsconfig. These administrative REST endpoints can be tested with the OpenDJ nightly builds. They are also available to ForgeRock customers as part of our latest update of the ForgeRock Identity Platform. 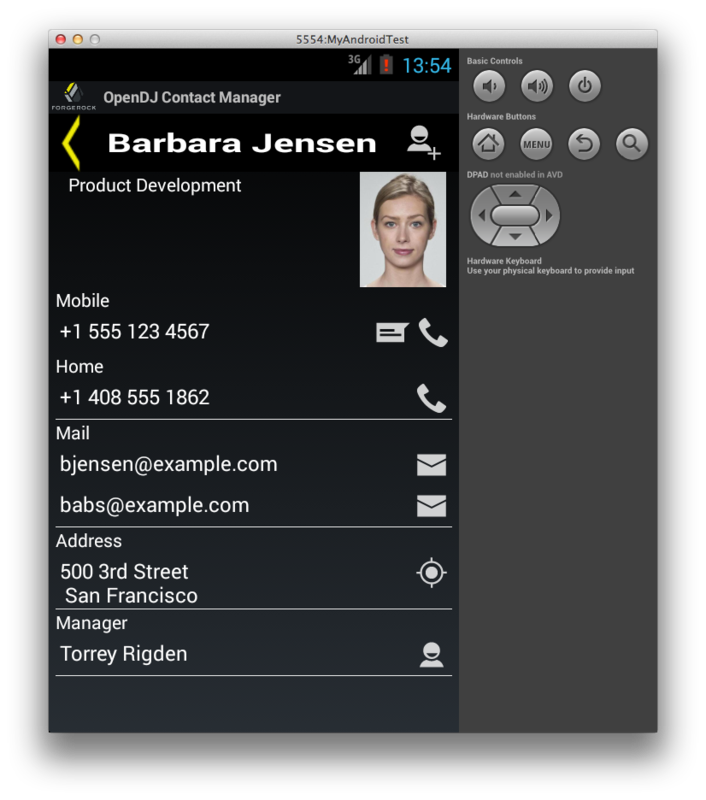 The OpenDJ Contact Manager is an open source Android application that was built by Violette, one of the ForgeRock engineer working in the OpenDJ team. You can get the source code from the SVN repository : https://svn.forgerock.org/commons/mobile/contact-manager/trunk. Mark wrote some quite complete documentation for the project, with details on how to get and build the application. He published it at http://commons.forgerock.org/mobile/contact-manager/. In future versions, we are planning to add support for OAuth 2.0, removing the need to store credentials in the application settings. As it’s open source, feel free to play with it, hack and contribute back your changes. I am really happy to announce the general availability of OpenDJ 2.6.0, a major update of ForgeRock directory service product, built from the tag 2.6.0 (revision 9086 in our SVN repository). – A REST to LDAP service, allowing an easy access to directory data using HTTP/JSON. The service can be run either embedded in the server or as a standalone web application. – A new upgrade process to ease transition from OpenDJ 2.4.5 or newer to 2.6. – New Linux native packages (RPM and Debian) to facilitate the automatic deployment of OpenDJ in the private and public cloud. – OpenDJ can be configured to delegate authentication to a Microsoft Active Directory service, providing tighter integration with Microsoft environment without the burden of synchronizing passwords. – An optional extension to remove specific attributes from updates, making it more flexible and easier to deal with legacy applications and migration tasks. – A way to synchronize SAMBA password attributes with the user’s password. – Some improvements on the integrity of references, that is now enforced at creation or on update. – More flexible and efficient audit logs. – A Java based LDAP software development kit. – An official stable documentation. For the complete list of new features, enhancements and fixed defects, please read the release notes. The binaries can be downloaded from ForgeRock Downloads. Happy 4th of July everyone !